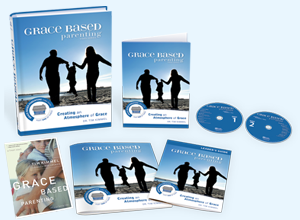 Help strengthen other families by hosting a Grace Based Parenting video study! Plan it with people in your church, your neighbors or friends who might share your hobbies or common interests. You can use it in a Home Fellowship class, Sunday School Class, Small group, Youth group parent meetings, a special Sunday evening study/series, a parents’ or family retreat, weekly breakfast or lunch group. Promotional Materials Downloads are available! Download logos (JPGs), Poster, bulletin insert, bulletin announcement, pulpit announcement, PowerPoint slide, Promo video (MP4) and possibly some images to help spread the word about your study! Need a shorter study? Split this study into two! If you need a shorter study, this 10 session study may be broken into a two study series. Study #1 – The Big Picture of Grace Based Parenting: Sessions 1-6. 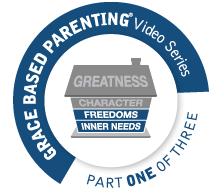 Study #2 – The Four Freedoms of Grace Based Parenting: Sessions 7-10. You can make this DVD study fit ANY schedule by doubling up on any of the sessions! The video portion is short enough to show two at one time and then you can choose which discussion questions fit into your remaining time. No matter what your scheduling needs, this study will work for you. Have fun and enjoy! !